Sometimes I dream of new kitchen appliances. I’m not sure if it’s a mom thing or an almost 40 thing or maybe it’s as simple as a home owner thing. But after nearly a decade with the same appliances, the shine wears off, life changes and it’s time for something new. Real talk: the following picture is not my kitchen. But it could definitely pass as a high-rent version of my kitchen. We have the white cabinets and back splash, the goose-neck faucet and the grey counter tops. 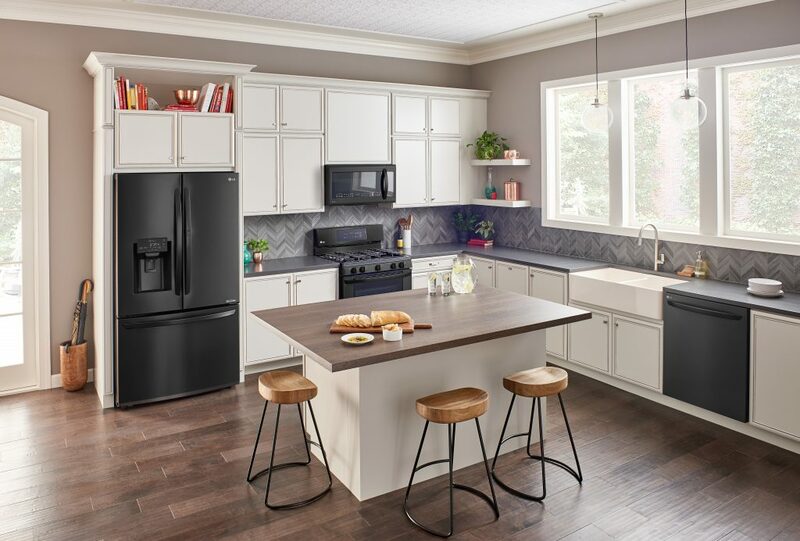 Our wood accents are lighter but this is close enough to be helpful because I’m on the hunt for a new dishwasher and I have my eye on the LG Black Matte QuadWash. However, while I do have shiny new counter tops and not so shiny white appliances, I’m not sure if I’m ready to take the plunge and switch to black appliances. I love the brightness of an all white look and stainless smudges too much for my liking. But when I saw the black matte finish in person while in the Best Buy suite at the Mom 2.0 Summit last month, I was smitten. It’s good y’all. Really good. You just have to see it for yourself. The next photo is what our kitchen actually looks like with our current white appliances. When we bought this house in 2010, it didn’t even HAVE a dishwasher, so we’re already better off. Sadly, we have never been happy with the one we chose and now that we have new counter tops, it doesn’t even fit properly anymore. 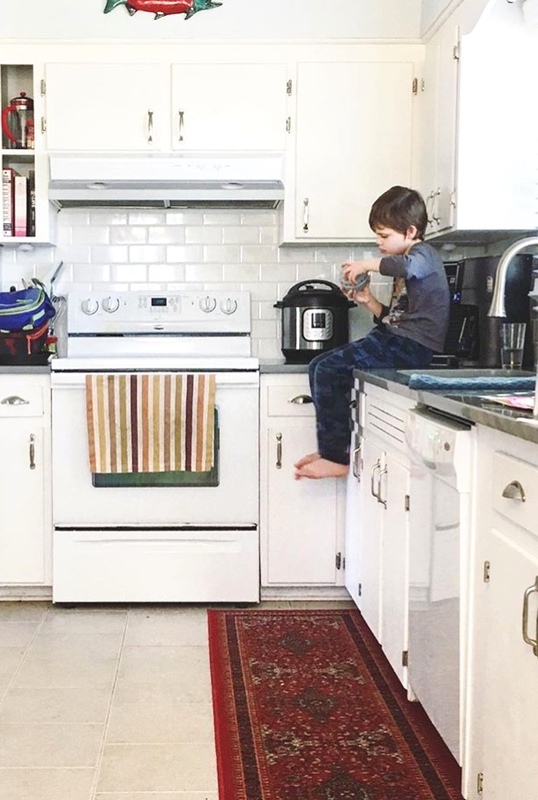 Photos: See before and afters from our first kitchen reno here, which I actually need to update now that we have new counters and back splash! Honestly, our sad little dishwasher really never had a chance. It’s loud, it takes forever and guys I can’t even believe I am saying this, but the top drawer doesn’t even slide all the way out! Like, I have to reach my hand in with a dish and try to wedge it in there to use the back of the drawer. It’s ridiculous. So I’m thinking it might just finally be time for a change. I can’t say we’ll replace all our kitchen appliances right now, but a new dishwasher is definitely doable. And if we don’t end up with black matte, it’s nice to know there are other color options available. But that’s just the color. I learned all about the LG smart kitchen appliances from Best Buy at the conference and they are next level. I’m talking wi-fi and voice-enabled so you can control them remotely, change settings and power them off. Doing laundry? You can start and stop wash cycles remotely, get updates when laundry is done and even receive reminders about scheduled maintenance. 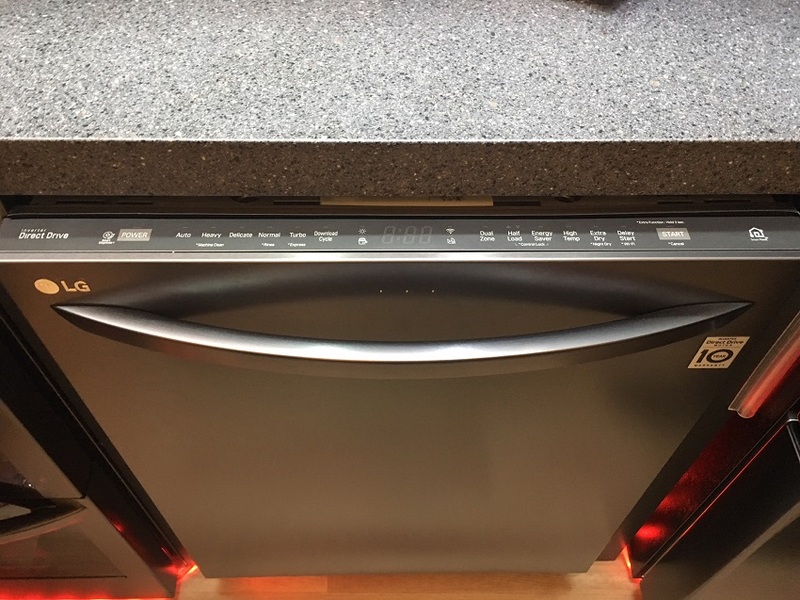 I love the sleek look of the black matte and having the controls on the top of the dishwasher rather than the front seems so extra. I love it. And when you open it? I could cry. 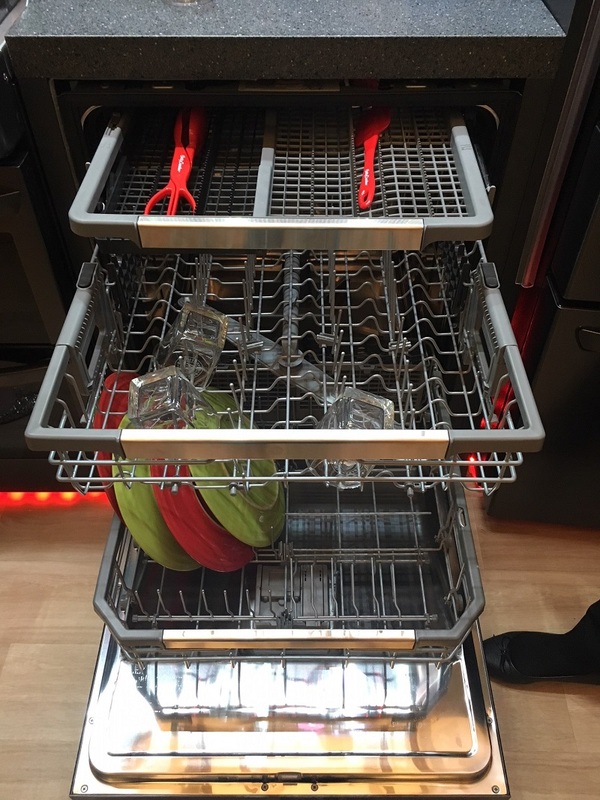 Not only do the drawers pull alllll the way out, but there is a third rack for serving utensils AND you can even adjust the space between each rack for larger or smaller items. Remember 5 minutes ago when I said I was smitten? Still true. Let this be a lesson to always meet your appliances before you bring them home. No blind dates (ie. online shopping) here. it’s too important! If you’re in the market for some new kitchen appliances, you won’t want to miss these sweet summer deals at Best Buy. Check them out below and happy shopping! There are a couple ways to save on new LG appliances at Best Buy! From now through mid-July, take advantage of one or all of the following deals! Summer Kitchen Bundle (good from 5/10 – 7/11) – Purchase a 4-piece Kitchen Bundle and receive up to $400 INSTANT rebate. LG and LG Studio models are eligible for this offer. Or grab the LG Ultimate Laundry Room Rebate (good from 5/10 – 7/11) where you can purchase a qualifying laundry bundle and receive up to a $400 rebate. Thanks to the team at Best Buy and Mom 2.0 for the chance to check out these products and for sponsoring this post. All opinions and claims of swooning are my own.